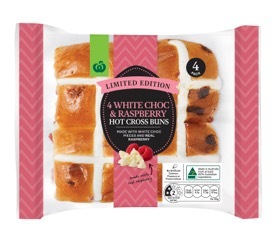 In a twist on an Easter favourite, Woolworths has introduced two new limited edition hot cross bun flavours: banana caramel and white chocolate raspberry — a stark contrast to the classic flavours we grew up with. The good old-fashioned bun is typically made with currants or raisins, marked with a cross on top, and traditionally eaten on Good Friday. However, over the years we’ve seen supermarkets and bakeries introduce flavours including apple and cinnamon, brioche style and chocolate. Not to mention, hot cross buns are hitting supermarket shelves across the country earlier every year. 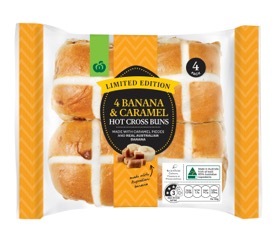 In fact, hot cross buns have been available at Woolworths stores since January, so it’s no surprise the supermarket giant has just released another addition to its expanding Easter range. Taking inspiration from popular desserts, the banana caramel hot cross buns are made with decadent caramel pieces and Australian bananas, while the white chocolate raspberry hot cross buns contains white chocolate chunks and raspberries for a sharp, fruity kick. “This year, Woolworths is adding another layer of decadence to your seasonal treats with two new additions to 2019’s hot cross bun lineup,” Woolworths Head Baker Ben Thompson said in a statement. “The limited-edition flavours of Banana and Caramel and Raspberry and White Choc have the perfect combination of dessert-like sweetness to compliment the classic fruit inclusions. It comes after the supermarket giant released a limited edition hot cross bun-flavoured ice cream at the start of the year. The ice cream contains raisins and a hot cross bun-flavoured ripple, complete with fresh Australian cream. Aussie customers enjoyed more than 72 millions Woolworths hot cross buns last year, with numbers from Coles thought to be similar. In January 2018 alone, the supermarket chain sold more 10 million hot cross buns. Traditional hot cross buns remain the favourite for customers, accounting to close to 60 per cent of sales, but non-traditional varieties grow in popularity each year. Last year’s popular brioche style is returning to the mix once again, along with mini cadbury chocolate chip. Woolworths isn’t the only supermarket that’s already selling Easter treats. Hot cross buns have been available at Coles stores since last December, but not everyone was impressed by the early arrival. The supermarket’ Facebook page was flooded with complaints after it announced it was releasing its hot cross bun range in January, with many accusing the grocer of capitalising on religion. “Remember what the lord said to his apostles. ‘Let he who is hungry eat hot cross buns, even in January’ Mark 13:24,” one sarcastic commenter wrote. “Hot cross buns are of religious significance. What’s the next religion you are going to debase,” added another. However, the early arrival of the Easter treat found support among others who were looking forward to indulging before Good Friday. “All these people angry over fruit buns. Obviously they’re in demand or Woolies wouldn’t sell them. If you don’t like them, don’t buy them & move on with your life,” one supporter wrote. Will you be trying the new hot cross bun flavours or do you prefer the originals? Do you eat hot cross buns before Good Friday?